What is the difference between the 2019 Mazda3 Sedan and Hatchback? As you probably already know, the Mazda3 has traditionally always come in two models. They were always called the 4-door and 5-door versions of the Mazda3. This year, Mazda is sticking to the two models but giving them a makeover complete with new names. This year you can choose between the 2019 Mazda3 Sedan and the 2019 Mazda3 Hatchback. So, what is the difference between the 2019 Mazda3 Sedan and Hatchback? Stay with us to find out as we highlight the best of both versions. How Does the Mazda 360 Degree View Monitor Work? Get a Mazda vehicle with a 360 Degree View Monitor to experience the most convenient driving experience. The video below will show you how the Mazda 360 Degree View Monitor works to make parking, reversing, and pulling out of a spot simple. After watching, come into Puente Hills Mazda to find out which available vehicles have this feature. What makes for a vehicle with optimal performance specifications? To start, a vehicle needs to be powerful. You want a vehicle that won’t shy away from a gravel road or an off-road path. Secondly, you want a vehicle that can do everything efficiently. Good fuel efficiency is a great starting point. Lastly, you want a vehicle that is stable, so that you don’t have to fear slipping around or missing your mark. The 2019 Mazda3 is all of these things. Come with us as we discuss the 2019 Mazda3 performance specifications and features. Does the 2019 Mazda3 Have All-Wheel Drive? An all-wheel drive vehicle is one that distributes power between all four wheels. In today’s age, all-wheel drive vehicles often use smart technology to distribute the power between the four wheels in the most optimal way to gain traction and make efficient use of power. More sedans are starting to become all-wheel drive vehicles. Stay with us to find out if the 2019 Mazda3 is a sedan with all-wheel drive and to learn about the benefits of all-wheel drive. Exterior color options get all the attention, but who said interior color options can’t be fun too? Sure, people see the exterior of your vehicle first, but the people who matter, friends and family, will spend a lot more time looking at the inside. Scroll down to view our photo gallery of the 2018 Mazda6 interior color options. Most vehicle brands call them trim levels. A set of features on a particular model bundled under a select price with a unique title is what a trim level is. Mazda offers different packages for their models, which is in effect the same thing. Packages, trim levels, whatever you call them, their purpose is to allow more options on a vehicle model. Instead of a one-size-fits-all, each model is broken into groups which may suit different drivers. The four variances for the 2019 Mazda3 are the 2019 Mazda3 Sedan, Select Package, Preferred Package, and Premium Package. Keep reading to learn about each of the 2019 Mazda3 package options and pricing by trim level. The Geneva International Motor Show is taking place this month from March 7th to the 17th. If you are lucky enough to go, you will see the new Mazda CX-30 vehicle on display for the first time. This is a new Mazda core model which will start seeing sales later this year. We are excited to be among the first to tell you about it, so keep reading to learn about the new Mazda CX-30 vehicle. The new Mazda3 vehicle will be available soon. Until then, keep updated on the Mazda3 with our blog. Today, we have videos of the new Mazda3 vehicle with both the hatchback and sedan styles being showcased. Take a second to check them out and admire the style of the new Mazda3 vehicle. 2019 Mazda CX-5: A Luxury SUV? They rank Mazda CX-5 2019 model number 1 in compact SUV in 2019. It has a score of 8.8/10 in a test involving 29 pieces of research and data elements. There are several reasons that this SUV made the A list. The detail includes athletic handling, upscale cabin, security components, and precise steering. This 2019 Mazda CX-5 model should be at the short list of compact SUVs you can go for this year. It tops the place in calls of production, safety, and acceleration. The 2019 Mazda CX-5 model is what Mazda has done. It shows what the Japanese automaker is composed of and can handle. This SUV competes with very many other SUVs in calls of price and production. 2019 Mazda CX-5 feels a class higher. We have to start by saying that the 2019 Mazda CX-5 is prettier inside and outside from all angles. It is more affecting to operate when compared H2H with the industry rivals. The Japanese company sees this as having greater potentials both in profitability and market position. They serve the 2019 model with the same 2.5 liter-four charged engine. The same engine is in several Mazda models including Mazda 6 sedan and CX-9 three-row crossover. 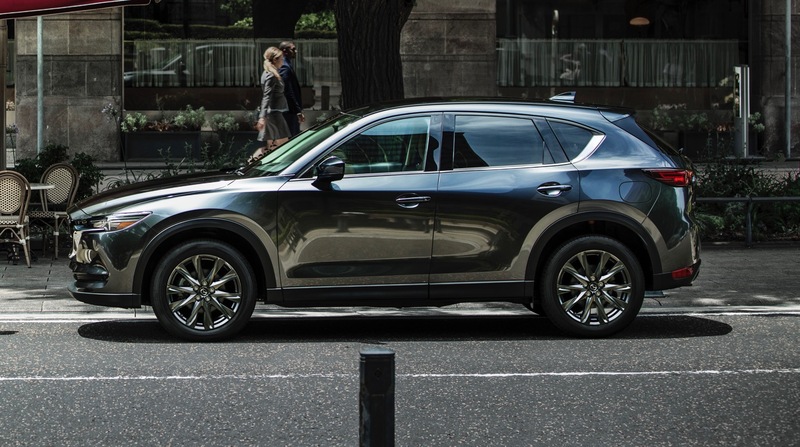 They pair the 2019 Mazda CX’s engine with all-wheel drive, the top of two trim levels. The turbocharger CX-5’s appeal isn’t for matching production and hence this engine is more exciting and diesel style. The 250-hp engine sends it to 60mph in 6.2 seconds. It is 2 seconds quicker than the base engine. What we love is that the engine is the string swell of torque low in the rpm range. It is very important to look at the cost. For the 2019 Mazda-5 has a starting price of $24,350 but most of the reviewers think this design has a much higher starting price. Mazda trims vary in cost. Taking a closer glance at the Touring and the Grand Touring trims they start at $26,615 and $30,045. When looking at the other two trims, the signature trim and the high-end grand Touring Reserve costs $36,890 and $34,870. If you go for the all-wheel drive, pay $1,400 except for those trims that come standard with the all-wheel ride. The CX-5 seats up to 5 people. Most of the reviewers think the front row has comfortable and supportive seats. It presents a decent capacity for passenger capacity with enough legroom, shoulder room, and headroom. If you get to the back row, you notice it’s a tight fit; but it can as well accommodate taller passengers. Though, it may be a test fitting three adults in the rear seats. The CX-5 2019 model presents two sets of LATCH car seat connectors. This SUV rated by the IIHS as the best compact SUV for the ease of use. The 2019 Mazda CX-5 has 30.9 cubic feet of cargo space with the rear seats and can extend to 59.6 cubic feet of space when folded. This is one challenge because most of the reviewers think these numbers are a little low for the SUVs in the class. As shown earlier, 2019 Mazda CX-5 features a new Turbo Four engine which brings the heat. It comes standard with a 187-hp 2.5-liter four-cylinder engine but you can at the same time take things to a whole new level with the optional engine. They now offer a turbo-charged 2.5 liter 4-cylinder engine which makes it one of the most powerful compact SUVs in the market. At the point of gas mileage, we cannot say 2019 Mazda CX-5 is the best but we can say it’s good. The SUV gets 25 mpg in the city and 31 mpg on the highway with the four-cylinder engine. This makes me think it gets to an average class. When you are looking for a luxurious SUV, the next thing you want to have in mind is safety. Mazda is also on the track for providing relatively safer SUVs in the market. The IIHS rated this model as a top safety pick. The SUV also earned high points in all the test results. The NHTSA also gave this model 5 star in all the safety test results. The model comes standard with a rear camera and several other safety features. Some of these features include forward collision warning, full-speed automatic braking, blind spot monitoring, full-speed automatic control, front and rear parking sensors, and a 360-degree parking camera. The 2019 Mazda CX-5 is a luxurious SUV featuring some of the best features in the market today. With all the features and the styling talked about above, it’s up to you to include this SUV in your shortlist. It is finally time to discuss the 2019 Mazda3 release date and take a first look at some of its features. The 2019 Mazda3 could be your next vehicle. It has everything you want, and it is arriving soon. Keep reading for more information on the 2019 Mazda3.